Posted July 19, 2016 in Uncategorized. 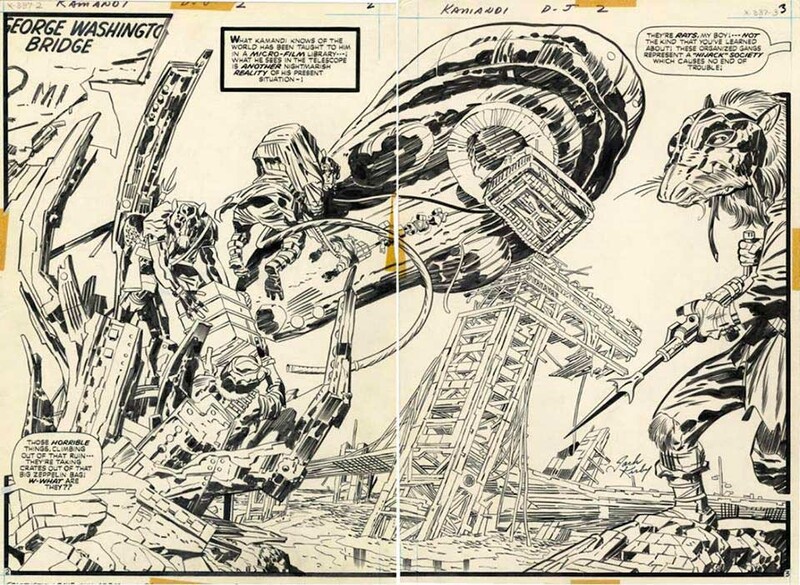 In comics, Jack Kirby is usually thought of primarily as an artist. This is mostly because of the work that did in the 60’s with Stan Lee and Marvel. Lee’s genius was for promotion, and while he helped put Marvel on the map and displayed his, Kirby’s and others names prominently on the work, he also assured that posterity would see him as primary writer and architect of the Marvel Universe and see Kirby merely as someone who interpreted Lee’s writing and ideas. Based on seeing Kirby’s margin notes on his original art, we now know that this was not the case. In fact, the opposite was true. Lee was the interpreter, putting his words in Kirby character’s mouths. Not only did Kirby usually plot the books as he drew them, he also gave verbal guidelines as to the character’s intent as well as dialog suggestions to the scripter. Lee’s scripts were often clever, with a bow to the hip and the modern, and readers responded well, feeling part of the club of true believers. Still, for me, the most important factor of storytelling is characterization. Kirby’s characters are always complete, essentially and physically. In other words, Kirby understood fundamentally what defines an individual, and he used that package of personality to express an aspect of human nature in the service of telling a story. 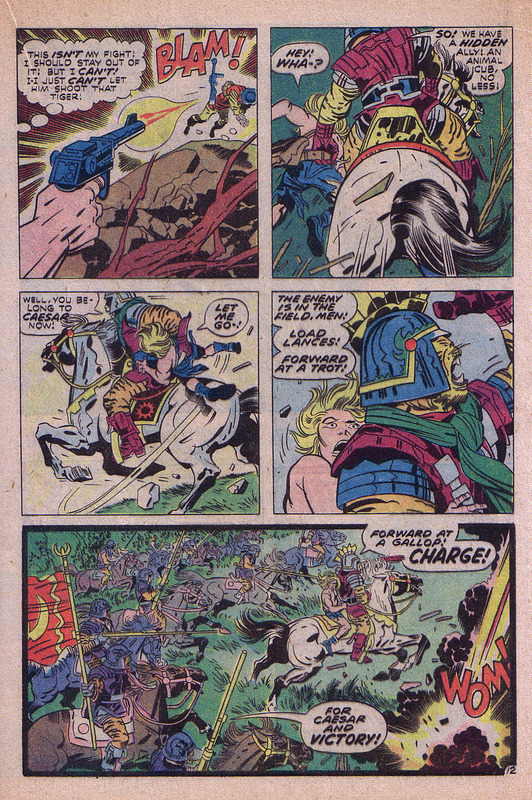 For instance, in Kamandi, Kirby takes full advantage of the specific animal nature of his animal characters. They become archetypes of people who embody those characteristics. This Page from Kamandi #2 above has always been one of my favorite Kirby spreads because it’s a real New York image, showing the Rats finally taking over the town. Throughout the series, Kirby hits the nail on the head with the anthropomorphic characteristics of his animals. They all basically behave like humans, but they also possess qualities of their specific animal natures. For instance, rats are vermin, scavengers, sly and shifty. In Kamandi’s world, the rats are hijackers, stealing the spoils of others work. Tigers, like the charismatic Caesar and his son Prince Tuftan shown on this page from Kamandi #1 below are the well-conditioned and highly trained Roman hordes. Gorillas are crude and bombastic and they live in what once was Las Vegas. This is merely an extreme example of what Kirby has done consistently as a storyteller during his entire career. Kirby’s characters are always sharply delineated and have powerful personas and clear intention in service of the story and its message. Kirby was a keen observer of human nature. Living in the bustle of Essex Street, he was acclimated to the chemistry of masses of people. He became adept at breaking down human nature to its essences. Some of his best work was with teams and gangs, often of children like the ones that he ran with through the streets of lower Manhattan. With his focus on group interaction, relationship was always primary. Arguably his most celebrated, influential and iconic team is The Fantastic Four. It is often noted that the Individual characteristics of that group are Elementals, whose nature and specific powers are based on Earth, Air, Water and Fire. The dynamic clash and synthesis of their disparate personalities gave the stories depth and dimension. Beginning with the fourth issue and the reintroduction of the Submariner, The Fantastic Four became a showcase for the introduction of scores of characters that would interact with our heroes and then often spin off into their own series. Dealing with relationships was what Kirby did best, and this can be seen in nearly everything Kirby worked on, from The Fantastic Four to Kamandi.